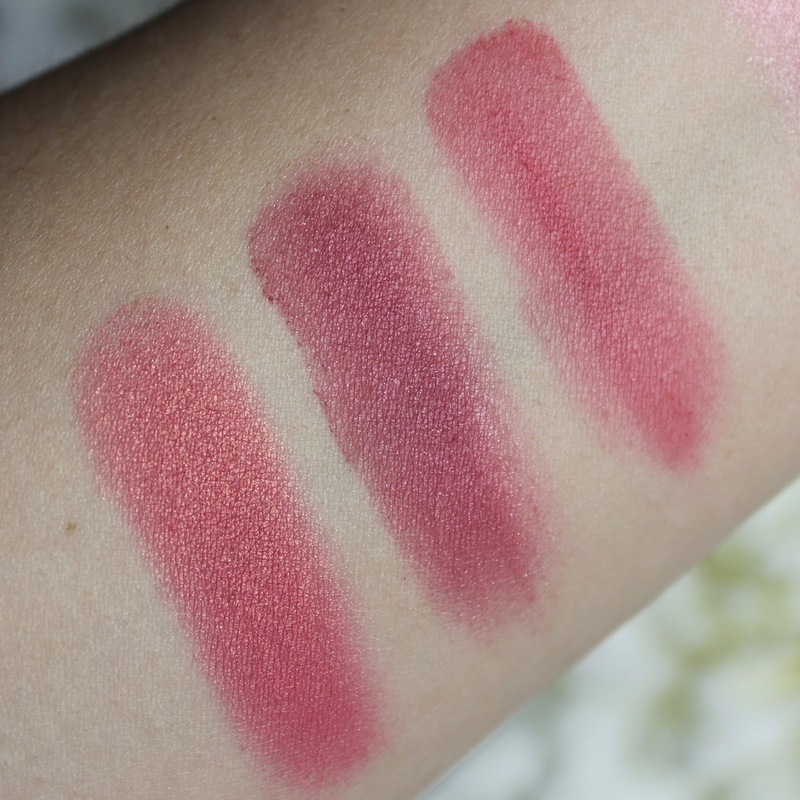 There are four blush shades available in the QVC range - I have three of them, and they are crazy pigmented - you literally just need to show the brush to the pan and pick up a teeny amount of colour and you'll still get a seriously gorgeous flush of colour. The shades here from left to right are peony, rose and apple. My favourite is peony - it's a beautiful rosy pink with a hint of gold and it instantly perks up the face and gives a healthy warm glow to the cheeks. 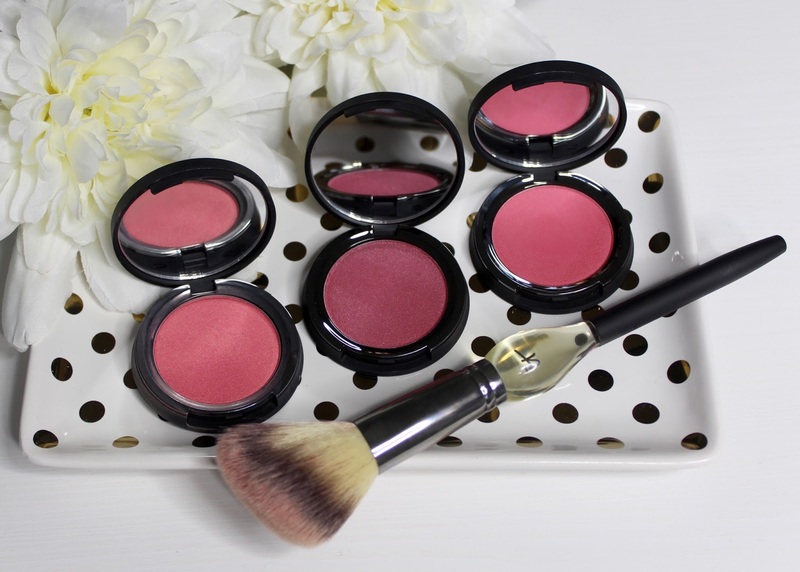 These blushes are super long-lasting both in terms of staying power and how long they're going to last before you run out! The blush brush It Cosmetics recommend to use with these is perfect too - it's a big fluffy slanted brush that fits your cheek so well that it makes blush foolproof - as long as I remember to go easy with how much colour I pick up, I can't go wrong. QVC have the single blushes and brush available as a duo for £28. This brow product comes in just the one shade with a twist up crayon at one end and a spooly brush at the other. 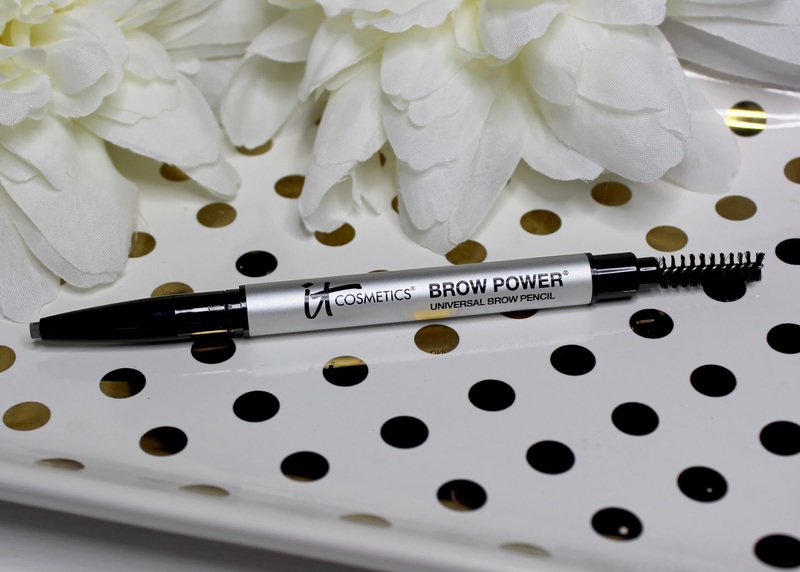 I really like the concept of this product - it's similar to my favourite Brow Wiz, but at a much more affordable price - QVC are stocking these in a duo for just £19.98. However as I mentioned, it's just one universal shade to suit everyone - the idea is that the amount of pressure you apply dictates how strong the colour will be, so for fair coloured brows you'd use soft strokes for a lighter effect, and you'd press harder for dark brows to get a more intense colour. Unfortunately for me, with my super-dark brows, the colour isn't right no matter how hard I press - it's just not dark enough to match my brows, and the shade I do get is a very warm toned brown which gives my brows a slightly ginger appearance. For those with lighter brows however, I can see this would work really well. On paper this is a product I wouldn't like - I generally don't get on with creme highlighters or blushes because I like to powder my skin to a matte, shine free finish, and creme should be applied on top of creme really, not powder. However, I make an exception for this highlighter because it's so beautifully sheeny and amazing, and also, because the texture is quite unique and not what I expected from a creme product at all. 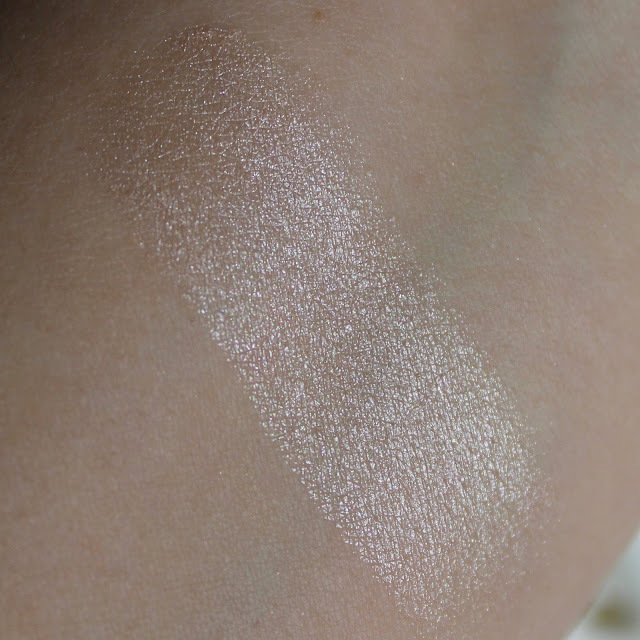 When you touch this in the pan and pick up some product it's not a jelly, slippery consistency or anything close, it's a much more dry creme, which makes it easy to avoid picking up too much product, and it also allows it to sit on my skin on top of powder without creating any obvious texture issues. 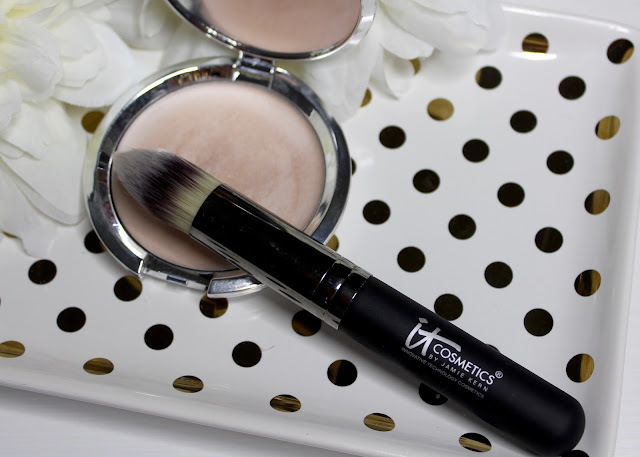 On QVC the highlighter comes with a lovely pointed brush (together these are £29) which you can use with the product, but I've also found applying the product by dabbing the skin with your fingers works really well too, and the product easily blends out. 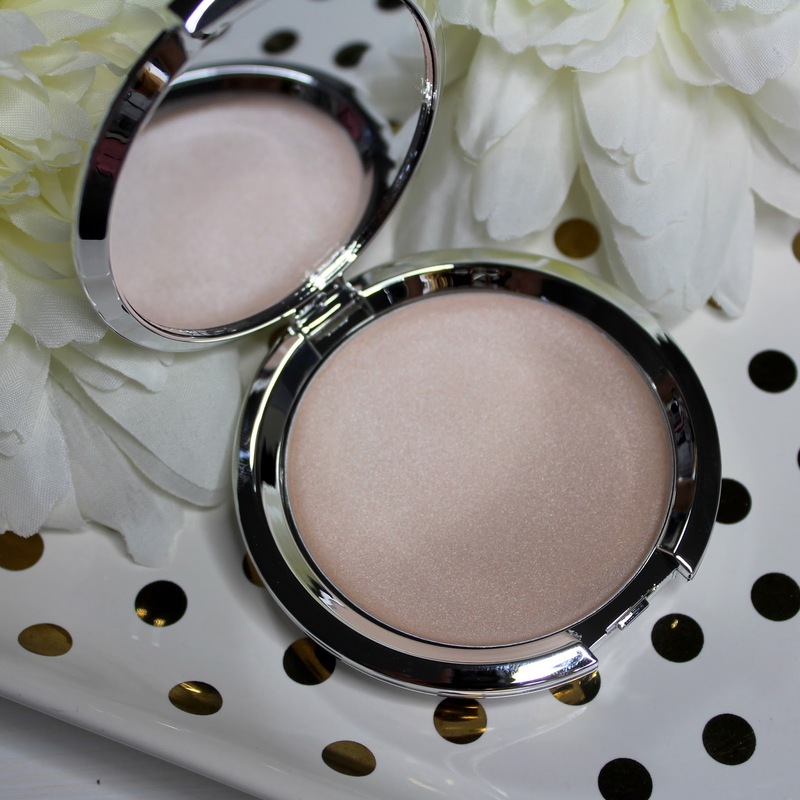 The mirrored compact is really handy for taking this on the go too. When I first tried this powder I was wowed - it really does make pores disappear in front of your eyes. What I've discovered over multiple uses however is that you can get too much of a good thing! I think I was getting a bit hooked on the pore shrinking magic and liberally plastering my face in this powder, which can left me looking dry and cakey. 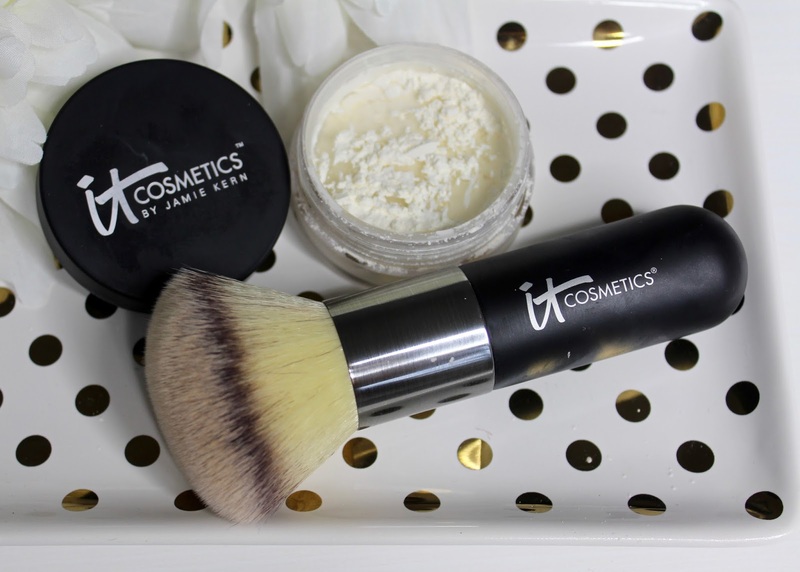 Now I'm back to using it more sparingly and taking the less is more approach - I tap a small amount of powder into the lid of the product and swirl the brush (which before lightly buffing on the skin mainly concentrating on the t-zone. This gives me the perfect amount of product and a finish that's perfect pore shrinking magic. This feels like a product I'll be repurchasing forever - so many products that promise to minimise pores don't don't work at all, so I'll be sticking with this because it really delivers. You can buy this separately for £21 at QVC, or together with the brush for £29, which I'd recommend. 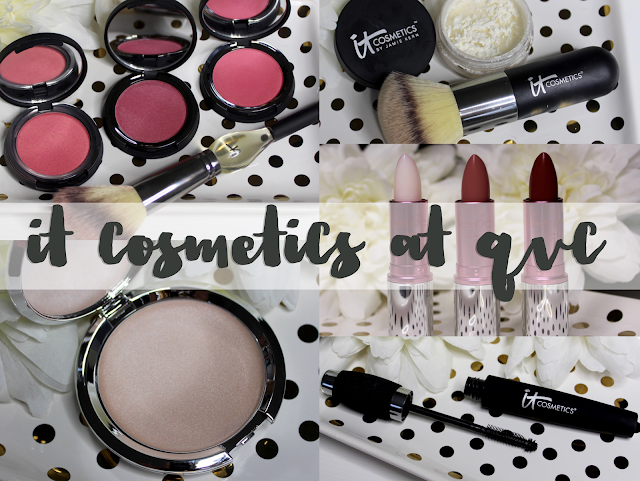 All of the brushes I've tried from It Cosmetics have been brilliant - they're so soft and fluffy and you can really feel the quality of them. 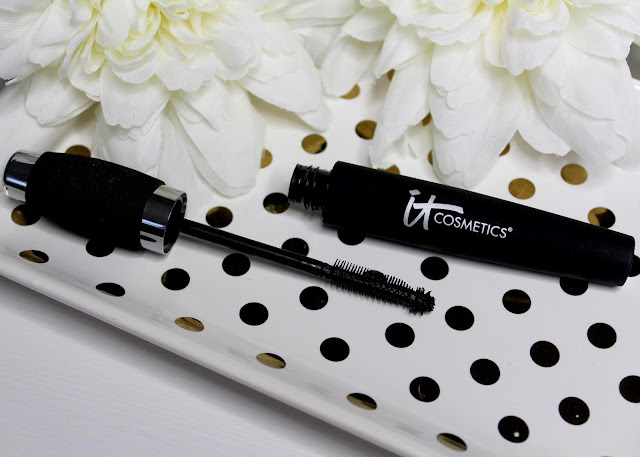 The Hello Lashes mascara is a high impact black mascara with a specially designed brush to capture all of your lashes - even the really teeny ones, using the call tip at the top of the applicator. I saw this demonstrated on a lovely lady at the launch and her lashes looked amazing and could have been mistaken for falsies because she got so much length to them and every lash was defined. 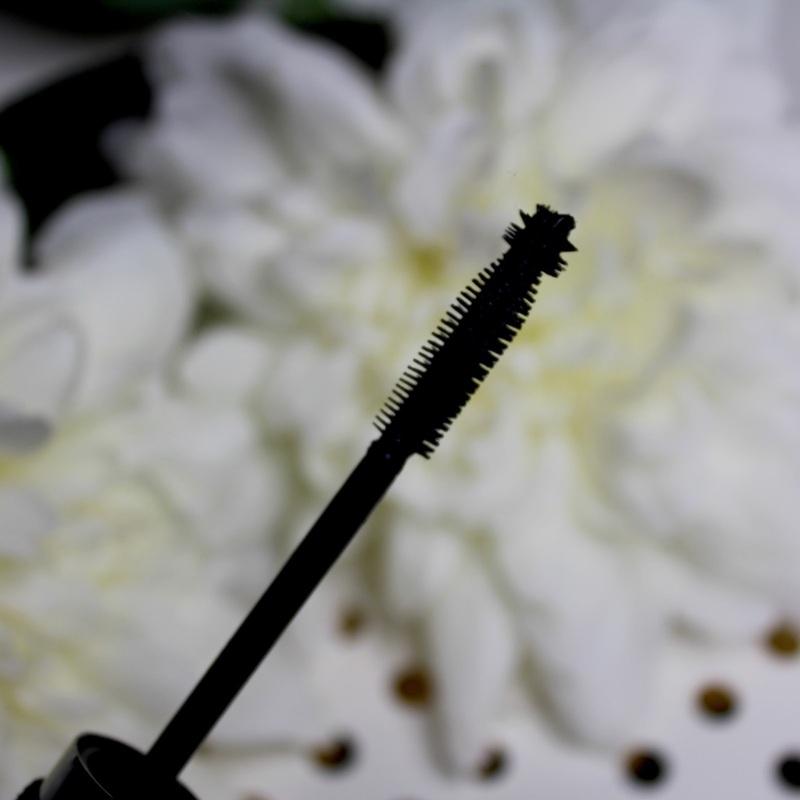 On me it's also a really great mascara - I like the brush and have been able to coat every lash for a bolder effect, and it does thicken and lengthen my lashes well, but as I have very short lashes to start with, I don't get that amazing false lash effect that those lucky enough to have longer lashes will achieve. I still think this is a great mascara for the price - if you buy it in the duo set it's £23, which works out at £11.50 each. 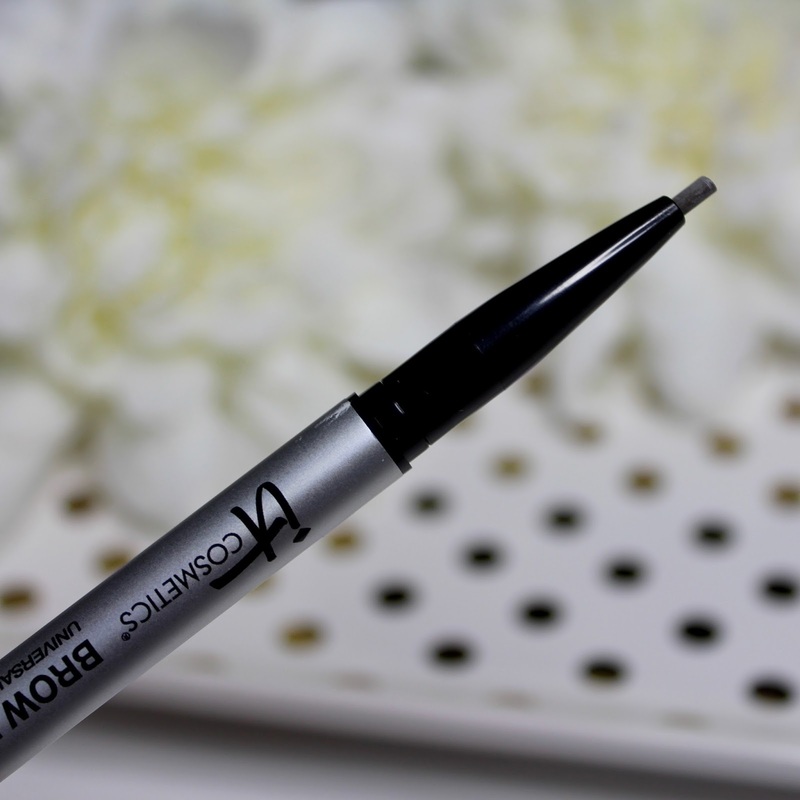 So this concealer was the first product I tried from It Cosmetics, and it was a great place to start! I originally bought it in the shade light (the lightest shade) as I did want to use it under my eyes, but actually it's an excellent coverage concealer for all over the face. Here from left to right are the shades tan, medium and light and you can also get a darker shade called deep. 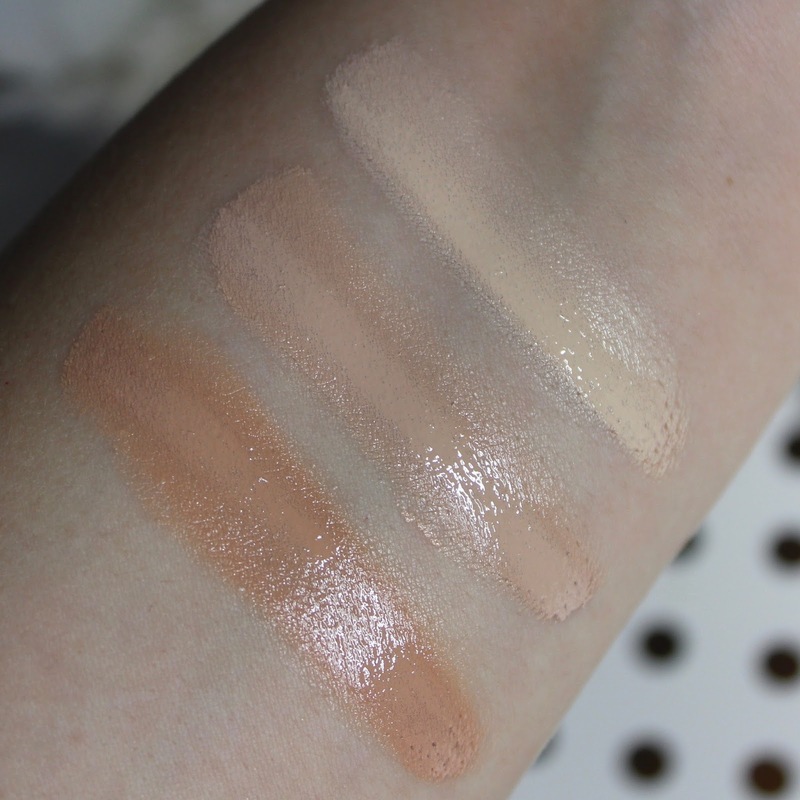 As you can see in the swatches, this concealer isn't messing around when it comes to coverage, this stuff is industrial strength, and on me I've found it can cover anything without looking like I have ten layers of product on my skin. The double ended brush is a perfect partner for the concealer - you can use the stiffer end to apply and the fluffier end to blend and this helps to achieve a really smooth finish, especially in the tricky under-eye area. The concealer and brush as a duo at QVC costs £23.64. It was suggested to me at the launch that you can use these concealers as foundation, so I gave that a go using a combination of the shades - I got mega coverage all over my face, but the end result did look like a lot of makeup, so for me it's not something I'd do ever day as although I want high coverage, I don't want to look like I'm wearing a lot of coverage. 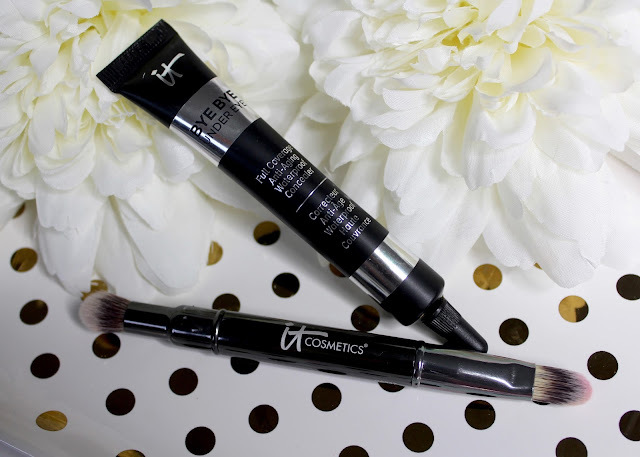 Worn as a concealer, under or over my foundation however, I love these and have already finished my original tube! If you have acne, scars or rosacea that you want to cover with something that will last all day, I'd really recommend giving these a try. 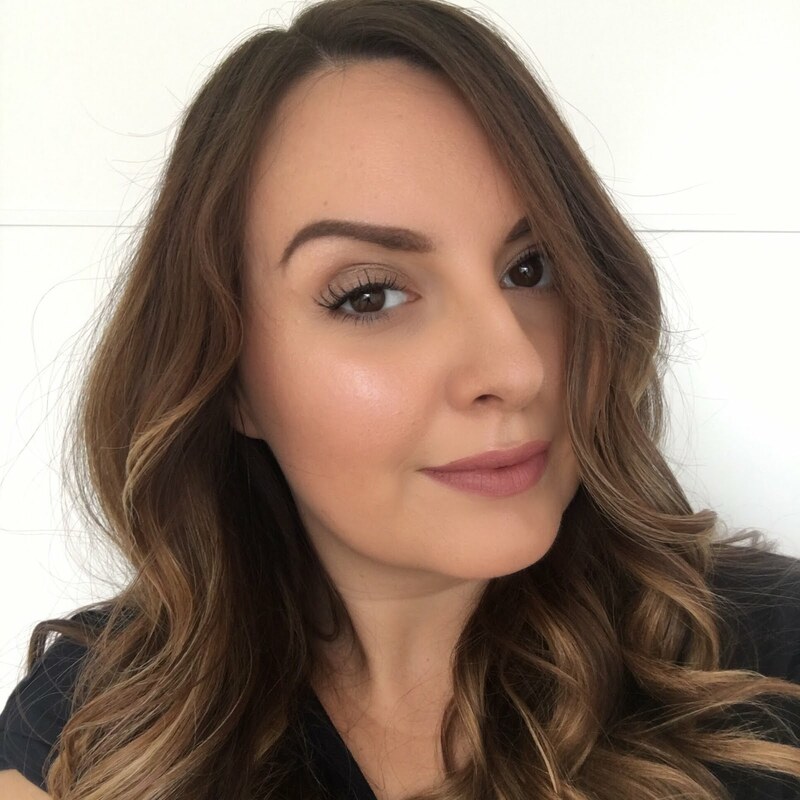 The concealer was originally formulated by the founder of It Cosmetics - Jamie Kern - because she couldn't find another product that worked the way she wanted to cover her rosacea, and she's really nailed it with these. 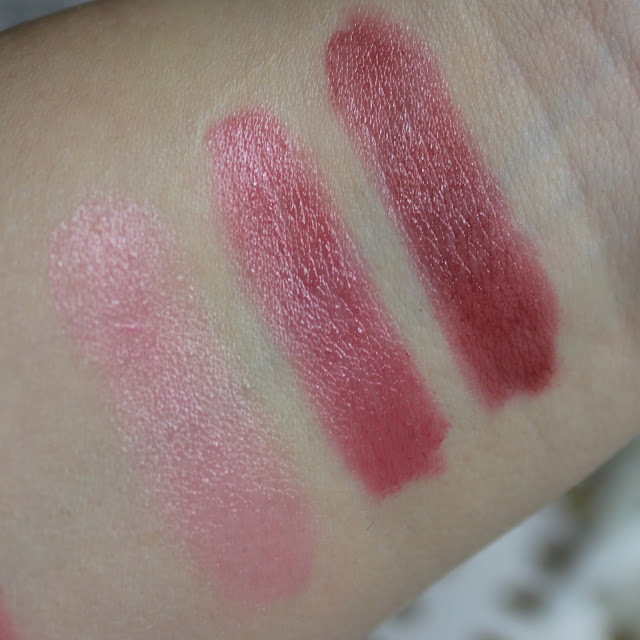 Lastly I have the three lipsticks from the collection and these are from left to right the shades Je ne sais quoi, love story and pretty woman. 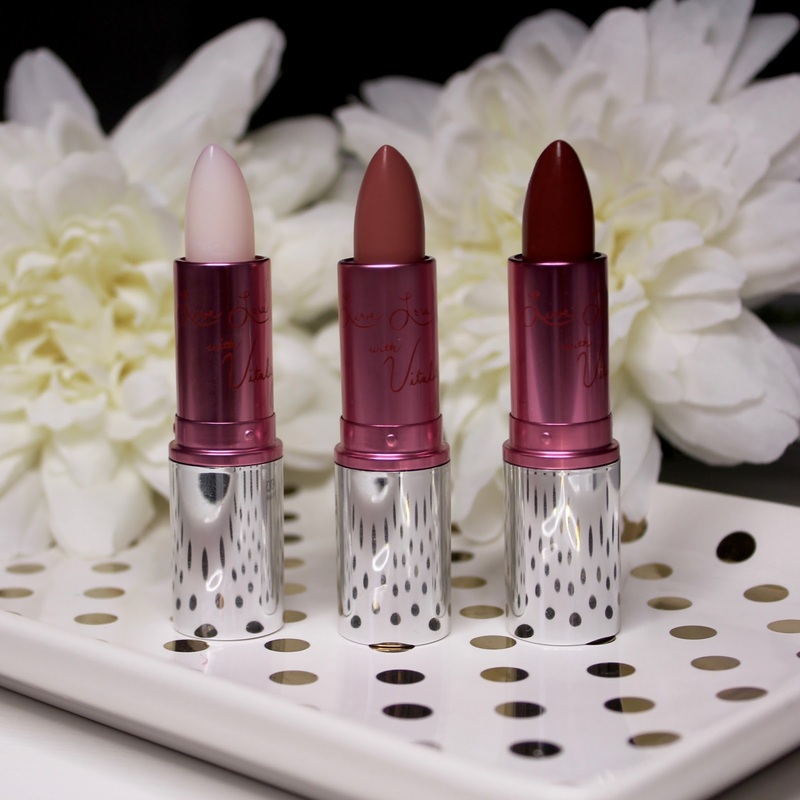 These lipsticks are designed to be multi-taskers, combining a lipstick, balm, stain and gloss all in the one bullet. Also the shade Je ne sais quoi changes colour from white to pink when you apply, and it'll be a different shade on everyone. The lipsticks are £16 each, or £29.50 for all three as a trio. For me these aren't the type of texture I'm into right now - I'm favouring the full on bold matte lip that everyone's wearing, but if you prefer something of a lighter texture that's going to give instant shine and leave a long lasting stain to the lips, then these are definitely worth checking out. My favourites from the range are the Bye Bye under eye concealer, the Bye Bye pores powder, peony blush and all of the amazing brushes! Have you picked anything up yet, or do you have any of these products on your wish list?